My second piece of Somdej Yant Har in excellent champion condition. It won 3x in different competitions including one organized by Samakorm. This piece need no introduction as I have shared few days ago the piece that I have been wearing all along. 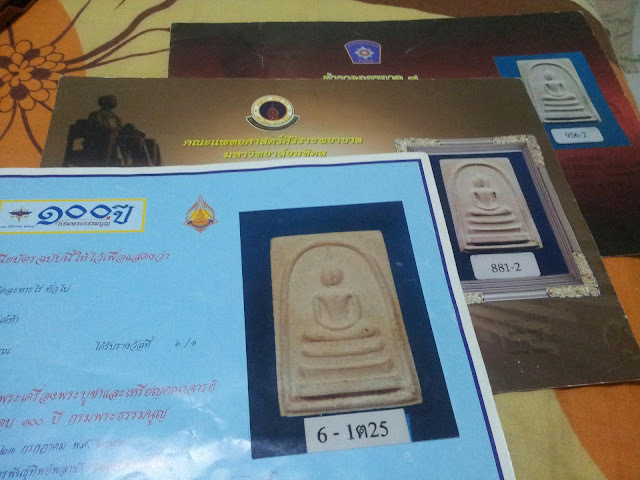 Made by LP Tim of Wat lahanrai, Rayong province. It was released together with the much acclaimed Khum phen plai kuman (KPPK). and in fact this somdej was mixed with Phong plai kuman as well together with the sacred buddhakom powder made by Pu Tim himself. That explained why somdej Yant har and Yant sam 2517/18 is much more expensive than other earlier batch somdej by LP Tim as well. Thus I always advise people to try out somdej yant har/yant sam or loob om before investing in an expensive KPPK. A pim lek, white powder KPPK block 2 costs 120k thb easily now. I have a fellow collector friend that practises Tibetan Buddhism and meditation for years and he told me that LP Tim amulets is very very powerful. He can feel it when he holds the amulet in his hand. It is second to LP Tim (Wat Changhai) 2505 Taulit. And this collector friend of mine has a vast collection of Somdej/amulets from LP Doem, LP Suk, LP Daeng, LP Nak and of course Pu Tim as well. Hope to see more write-up about your amulets.Very informative indeed.